Feedback Foundation is the implementation partner for FIPL’s ‘Bhond Model Village’ CSR Project in Mewat (Nuh) district of Haryana. A visit of the Board of Directors of FIPL to Bhond village was organized on 11th August 2018, to appreciate the CSR initiatives undertaken over the last 4 years and their impact, and to encourage the community for their ongoing effort towards the betterment of the village. 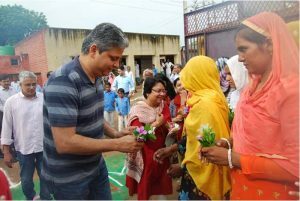 The Bhond village community welcomed the Guests with great warmth and affection and presented small bouquets of locally grown flowers. A beautiful welcome song was sung by the girl children from the Government Middle School in the village. They also recited some of their own poems on the themes of gender equality and education for all. Tarannum, a young girl from the village, confidently presented an account of the engagement of the Feedback team with the community, consistent effort across multiple dimensions and the impact made on their lives. It was truly inspiring to witness the participation of the girls from the community, in light of the situation in 2014 before the Feedback interventions, when enrolment of girls in the school was particularly low and drop-out rate was high. 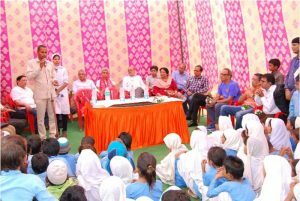 Village Development Committee (VDC) and School Management Committee (SMC) members then spoke with great emotion about the work done by Feedback in the village and the sense of pride and ownership developed in the villagers towards their own well-being. 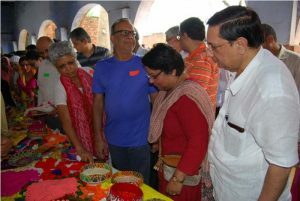 The women of the village had setup a kiosk for sale of their hand-made products, especially the ‘chingeri’ baskets hand-woven using dried wheat stalks and crochet home-décor products, which was a roaring success.The Guests were requested to inaugurate a new community park by planting a few saplings. The villagers then took them on a tour of the village and the Guests appreciated the clean and green environment, fruit trees in households, solar street lights, internal roads, the Anganwadi center and the Computer center. The visit ended with a delicious kheer, specially prepared by the women ands erved with care. The Board of Directors and Senior Leaders of FIPL expressed that it was an immensely enriching and enjoyable visit. 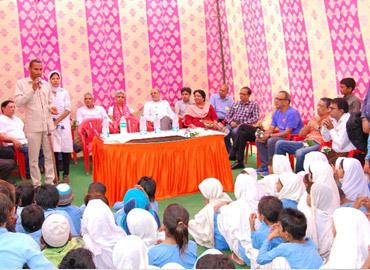 The genuine affection and respect from the villagers was heart-warming and provided a fresh impetus to FIPL and Feedback Foundation’s commitment towards transforming Bhond into a Model Village.